Sorry, no review of SoulCalibur II yet. Nintendo Europe is pleased to announce that Soulcalibur II is scheduled for release for NINTENDO GAMECUBE on the 26th September 2003. The game will be co-published by Nintendo and Namco in Europe, and Nintendo Europe will be responsible for the distribution of the game across the continent. A new stage in history begins with the highly anticipated return of the Soulcalibur franchise. 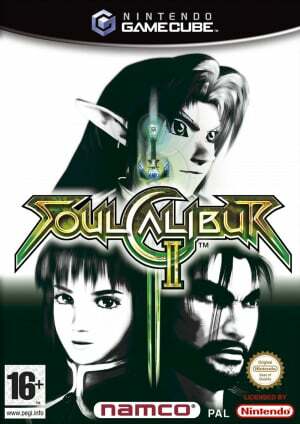 Soulcalibur II is one of the greatest 3-D weapons-based fighting games, providing non-stop action, excitement and surprises as players go one-on-one against their favourite challengers. As an exclusive for NINTENDO GAMECUBE, the character Link from the infamous Legend of Zelda series will be a playable character in the game, wielding his Master Sword with gruesome accuracy. In the game 13 historic fighters return plus all new combatants including Necrid, specially designed by Todd McFarlane Productions, Inc.
With seven exciting modes of play including Arcade, Vs, Time Attack, Survival, Team Battle, Practice, and Weapon Master, Soulcalibur II is set to be another NINTENDO GAMECUBE must buy. Soulcalibur II which won the E3 2003 award for best fighting game will be available for NINTENDO GAMECUBE from 26th September 2003. One of my favourites on the GC! This has got be my favorite SoulCalibur game...yes even more than the DreamCast game which I also have pretty high on the list. NintendoLife needs to review of this game.